How often Jesus is accused of breaking the Sabbath. When we hear Sabbath and Jesus at the beginning of a gospel incident we can almost envision him picking up a stick, looking for a hornets next, and whacking it. The Sabbath day that recalls the seventh day when God rested after the work of creation, became the day when Israel rested with God. As Adam and Eve who cared for the garden relaxed with God, so did Israel. The Sabbath looked to the day of a New Garden, the day when all the world would stream to Jerusalem, and God’s love for Israel would turn a new page that was like the first page. The Gardener would open those locked gates and the angel would sheath her sword. In the New Testament the Sabbath disappears. In Jesus a new sacred time has begun, the time of fulfillment has arrived. We are invited to come to him to find our rest. The twelve have received authority to preach and to heal. They will travel light and not be surprised if they are not always accepted. Now they return having expelled demons and worked cures. It must have been an exciting moment as they gathered, these fishermen, a tax collector, the questioners, the Sons of Thunder. And Jesus, who wakes people up on the Sabbath, calls them to come by themselves and rest a little. I wonder if Jesus intended to go not too far in the boat, just far enough to a quiet place where he wanted to enjoy their sharing like a mentor? He wanted to hear how the Father was working through them and maybe guide them away from any thoughts that sounded like one ups-man-ship, ‘look what I was able to do’. He may have wanted them to be in touch with what he seems to have loved – the unique encounter with a man or a woman and seeing them blossom when God’s love affirmed them. How did they feel to be the giver of such a gift? Did they realize a bit more that they too were being given such gifts? Mark’s gospel shows us John the Baptist being put to death between the apostles leaving and their return. Would Jesus have calmed their fear that one so like him suffer such violence, and deepen them a little more in the mystery of his own suffering? Well, something else happens. Jesus is the one who walks into the hornets’ nest! Everyone knew about his secret place apparently. The apostles learn a new lesson from the Master: The response of an open heart to sheep without a shepherd. The day of rest turns into a day full of work until evening; no food in a desolate place into a miracle of plenty; and the memory of a short, calm boat ride into a rough night’s rowing against wind and waves. Then Jesus appears to them on the water. They are bewildered. Their collective heart is hardened; they do not understand the one who is with them is the new Sabbath. This was not the time to talk to weary fishers of men. All they did, plus so much more, what a day! 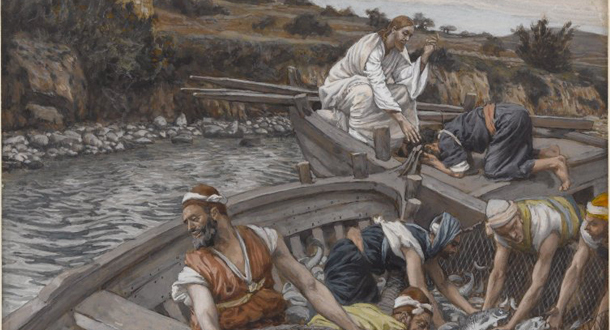 Jesus would shatter death and their hardened hearts in due time, being the new Sabbath, always and again inviting us to hop in the boat to rest with him. Error: Error validating access token: Session has expired on Monday, 18-Mar-19 14:16:37 PDT. The current time is Thursday, 18-Apr-19 19:23:58 PDT.